JW Pharmaceutical said Sunday that the Ministry of Food and Drug Safety has approved the domestic sales for Hemlibra, a hemophilia treatment developed by Chugai Pharmaceutical, a subsidiary of Roche. 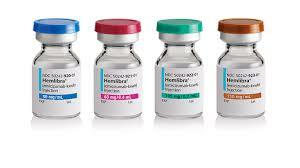 Hemlibra is the only subcutaneous hemophilia A treatment approved for people with hemophilia A with or without factor VIII inhibitors. It is a first-in-class drug that uses dual-specific antibody technology that mimics the coagulation mechanism of Factor VIII, and binds to activated Factor XI and Factor X at the same time. Hemlibra has improved the convenience of patient self-administration as it only requires the patients to inject the drug once a week. All of the preventive therapies launched so far have had to be administered intravenously two or three times a week. JW will begin sales of Hemlibra in Korea after negotiating the price of the drug with the Health Insurance Review and Assessment Service (HIRA). Global Data, a pharmaceutical market analyst firm, predicts that Hemlibra will bring in 5 trillion won ($4.4 billion) in annual sales in the global hemophilia market by 2020. According to data published by HIRA, the local market for the disease is about 150 billion won.